Beautiful new property. Fully equipped. Air conditioned. Sleeps up to 8. Relax & unwind in this beautiful villa. 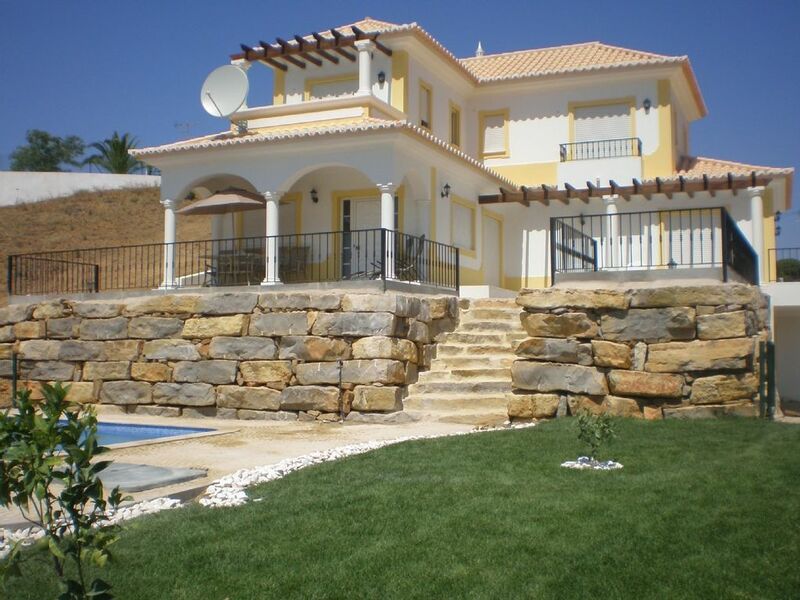 Set in a secluded area 10 minutes drive from the historic town of Tavira and beaches. Peaceful location with beautiful views. 35 minutes drive from Faro airport. Large outside area. Saline pool. Fully equipped kitchen with dishwasher, washing machine & microwave. Satellite TV and DVD player. Outside eating areas and traditional Portuguese style barbecue. Large games room with pool table & table tennis. Fantastic views. Near several good golf courses. Air conditioned. Available for rental all year round including long term lets. Beautiful villa with surroundings to match! Very neat, clean and tidy villa, great kitchen and bathroom facilities (bedding and towels changed once during our stay by property agents). More than enough space for our needs (4 adults, 2 children). Games room was well used by our son (9yo) and stocked with ample supply of pool inflatables, sun bed cushions and more. Location is away from the hustle and bustle of the local town, however it was not far to drive to get the local amenities. We were apprehensive about the salted swimming pool however, it was fab - used daily by all members of the family. Pool was perfect in size, not too cold either. Pool was attended to once a week, along with the gardens. Set in very quiet, scenic place. We loved to sit out on the terrace overlooking the pool in the evening, listen to the wildlife, and watch the sun dIssappear behind the hills. A very chilled out place. We've just returned from 10 nights in Little Vineyard, and what a stunning villa it is! Set in the most peaceful setting, this villa has everything you could want. The owners are more than accommodating and the management company polite and efficient. Having visited Portugal annually for over 25 years, this is easily one of the best villas we've ever stayed in. The game room was a big hit with my husband and brother in law! Thank you once again Kim for letting us have an amazing first holiday with our son and hope you'll have us back again very soon! Lovely property with everything for a great family holiday. We have just returned from our stay at the Little Vineyard. The property is very comfortable, well maintained and felt like a home from home. The setting, amongst the hills above Tavira, is beautiful and calm. Dealing with the property owner was very straight forward and the management company in Tavira were great (not that we needed them for anything) - very welcoming, good recommendations and got the sense that nothing would be too much trouble. We would love to stay again if you'll have us back Kim. Beautiful, well equipped, clean and super location - ideal for getting away from it all but Tavira 15 mins away. With hindsight, and to make the best of our stay, we would have had the pool heated as despite the hot weather the pool didn't warm up! In this modern age wifi would have been brilliant, the absence of up to date maps/books of the area meant that we needed to locate wifi in town to research the area. Property management very friendly, cleaners did a super job but we did not have any pool towels (so bought some) and only had one towel each for the week we stayed. Only little things which did not affect our enjoyment of the property or the surrounding area. Owner very friendly in communication regarding rental and responded very promptly. Would recommend to friends and relatives and plenty to do in driving distance. I went there with my husband, my twin boys (14 years) and my sister-in-law. What impressed me most was the quietness of the surrounding hills. Furthermore, the villa is comfortable, new, clean, spacious and well looked-after. The salt-water pool is gorgeous. The company that looks after the villa is very helpful and nice. Tavira, the next town, is a little jewel. We liked to go there in the evening when the town actually comes to life. The best beach for us was pray verde. The beach there is very clean, there is a good chiringuito and a very good restaurant. We all enjoyed our stay immensely and would always recommend this villa to our friends. We had a fantastic, relaxing, two week stay at The Little Vineyard in July 2012. The villa is very modern and in excellent condition, with every facility that you could want (including electric blinds on all the windows). The little valley that the villa sits in is idyllic and and very peaceful, with orange trees and grape vines at the bottom of the garden. Perfect for sitting and watching the sunset with a glass of wine. Tavira is about a fifteen minute drive away and is a lovely historic and unspoilt fishing town with some great restaurants. The new shopping mall, just outside Tavira, also has everything you need in one place, even a cinema! All in all, a lovely villa in a great location. The beautiful town of Tavira (meaning town of churches) is full of places of historical interest including the old Roman bridge. Nearby are the golf course of Castro Marim, Benamor, and Quinta De Ria. The villa is situated just outside a national park with scenic walks and a nearby lake. Tavira has a regular boat service to the Isla Tavira with its stunning beach and watersports. Other beaches nearby include Manta Rota and Praia Verde.